Girl Kuripot Girl Kuripot: Girl Kuripot Giveaway - 14 Travel GCs from Anywhere Philippines! Girl Kuripot Giveaway - 14 Travel GCs from Anywhere Philippines! Hi Guys! It's time for another round of Girl Kuripot Giveaways! Can you guess where this Anywhere Philippines trip is? Listen up! There will be 14 winners for this giveaway and you can win up to two times for the whole giveaway period! The 12 winners for the 4 weeks will be randomly selected (random.org) while the remaining 2 will be selected based on the most number of entries. If tied, those with same most number of entries will be selected randomly (random.org). 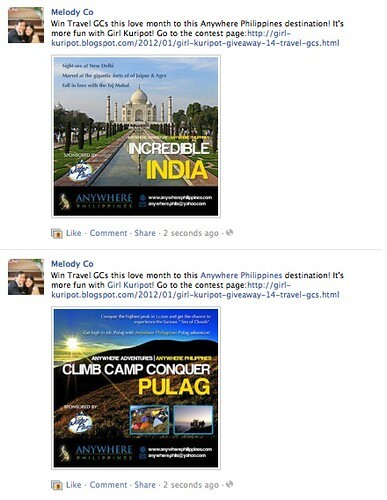 You can use your Anywhere Philippines GC in a whole lot of locations this 2012! Will it be a weekend trip in Mt. Pulag, Sagada, Ilocos, La Union, Nagsasa, Caramoan, Calaguas, Baler, Coron, Donsol, Apo Reef/Pandan Island, Cagbalete, CDO, Camiguin, Bukidnon, El Nido or India?! Here's how to win those GCs! 1. Go to this page in the Anywhere Philippines website. Grab any or all of your desired Anywhere Philippines from this 2012 Anywhere Philippines trips page. 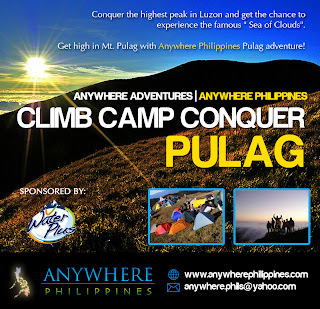 "Win Travel GCs this love month to this @Anywhere Philippines destination! It's more fun with @Girl Kuripot! 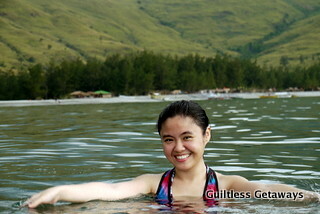 Go to the contest page:http://girl-kuripot.blogspot.com/2012/01/girl-kuripot-giveaway-14-travel-gcs.html". 6. Finally, tell me what you did with your name and email address in the comment section below. Send me additional comments if you joined more than once in the next weeks. GK is targetting to get to this mountain next! Can't wait to go camping again. Hehe. The Anywhere Philippines GCs can be used one at a time per trip per person. It is transferrable though so you can bring a friend for the 2nd GC if you win. All trips must be made before the validity end date (October 31, 2012) so you can go ahead and prepare for that summer weekend getaway. Winners will be announced here and on my Twitter account. They will also be contacted through email. This giveaway is not connected with the Facebook company. Done everything you asked. Lol. Keeping my fingers crossed. Done with everything. Hope I win! =) Keep up the great work! I'm super excited :) I did everything! Hope to win too! I always visit boy kuripot's blog (as in daily)...now I'm gonna follow you both! I did the 5 mechanics. In fact, i posted the 18 places in my fb wall. ***but i used aguiladm03@yahoo.com in fb. This time, I did them all right. Whew. Step 6: checked! I really love to travel, pero di pa rin nagkakaroon ng chance to ng mas malayo, masyado pang busy enjoy life sa ganitong bahagi ng buhay. but, im looking forward to fulfill one of my dream; to travel around the world.